"Don't I look like an Indian Ray Romano?" 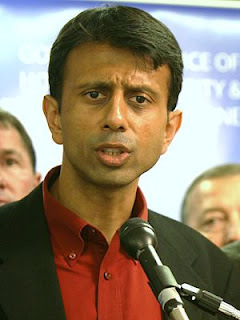 In a recent interview with The Huffington Post, the boyish Louisiana governor Bobby Jindal reflected on his horrible, horrible response speech to the president's 2009 State of the Union address. "It was obviously a badly delivered speech," Jindal said. "The good news is, I don't think it's had an impact on my career." Considering Jindal is on the short-list for GOP vice presidential nominations, it would sound as if Jindal wants to become one of those much-maligned Washington insiders.